Oliver, originally uploaded by bill kralovec. There are moments that you wish could last forever. The past few days I’ve been taking out Owen and Oliver for bike rides. At first they were complaining, but yesterday they asked me to take them out and we had a lot of fun. Belgrade has kilometers of bike paths around the city, either along the river, in New Belgrade, or in several forested parks. I would like to see even more, but compared to other international places I have lived, we are blessed to have so many kilometers to safely ride. The city could even put up more bike paths as evidenced by the many people riding. 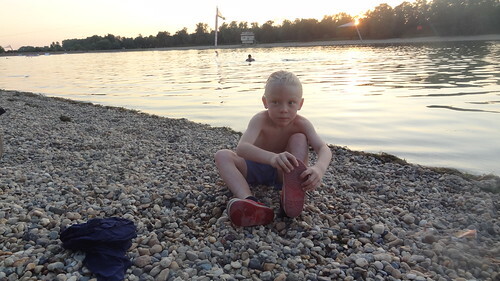 Oliver is shown above at Ada Ciganlija after we took a swim to cool off from the ride. I would love to re-live these bike rides- as the kids are growing up fast and these opportunities will be fleeting as they get older. 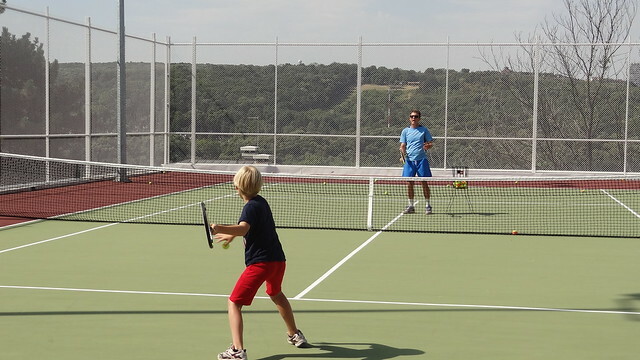 We also spent the week improving our tennis games with coach Mili. He is teaching us the Split Method for forehands and backhands. I can’t recommend him enough and I’ll be blogging about it later. Below is a photo of Owen working with him yesterday.